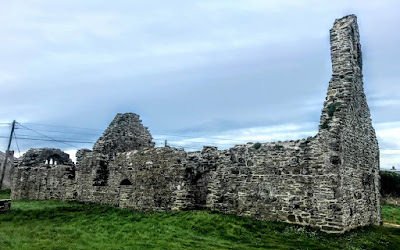 Hook Head and the Hook Peninsula in south-west Wexford includes hidden coves, some important mediaeval sites, including the Hook Lighthouse, and some important architectural and archaeological sites, such as the castles at Fethard, Dungulph, Houseland, Slade and Kilclogan, and Loftus Hall. The area is replete with legends, myths and tales about the giant Finn Mac Cumhal, Celtic saints and monks, Anglo-Norman landings, ghostly sightings and early Ogham stones. But this is also an area with a rich collection of churches, monastic sites and holy wells, including the churches at Templetown, the abbeys at Tintern and Dunbody, and early church settlements. 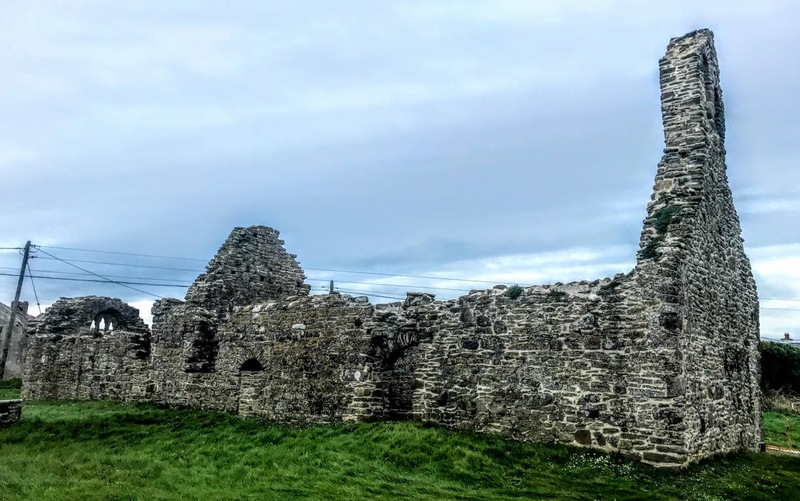 On the way back from visiting Hook Head and the Hook Lighthouse, I stopped to visit the ruins of Hook Church or Saint Dubhán’s Church at Churchtown, linked with Saint Dubhán, who came to the Hook from Wales in 452 AD and established a monastery on the site of the lighthouse. 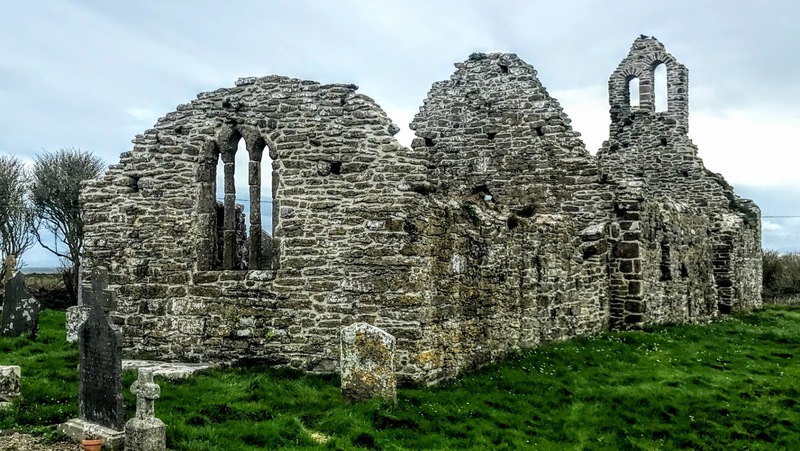 The date given for his arrival is just 20 years after the supposed arrival of Saint Patrick in 432, and while Saint Patrick is said to have been working in the northern part of the island. Saint Dubhán is said to have lit the first warning beacon for ships at Hook Head shortly after his arrival. This beacon was maintained by the monks for 700 years until the lighthouse was built. Saint Dubhán built a church and soon the whole peninsula was known as Rinn Dubháin. The name Dubhán can be translated into English as a ‘fishing hook’ and so, it is said, the peninsula became known as Hook Head. The church was later attached to a house of Augustinian canons. 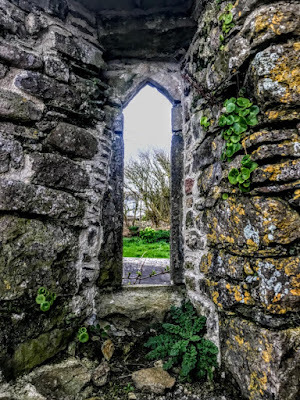 Mediaeval references date from 1245, when the chaplains of Saint Saviour of Rindeaun were urged to maintain the lighthouse. The remaining ruins of the church date from the 13th or 14th century. The nave dates from the 13th century and the chancel was added later. 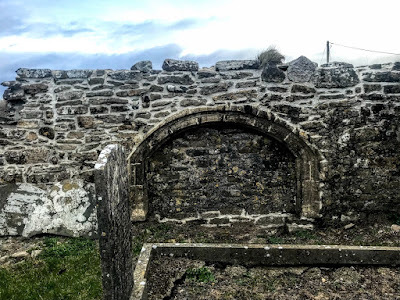 The original east wall of the mediaeval church, now in the centre of the church, includes remains of antae or projections of the side walls beyond the gable, and there is evidence of a round-headed window in which a doorway was inserted to give access to the later chancel. The nave, which was extended in length, and the later chancel survive almost complete. 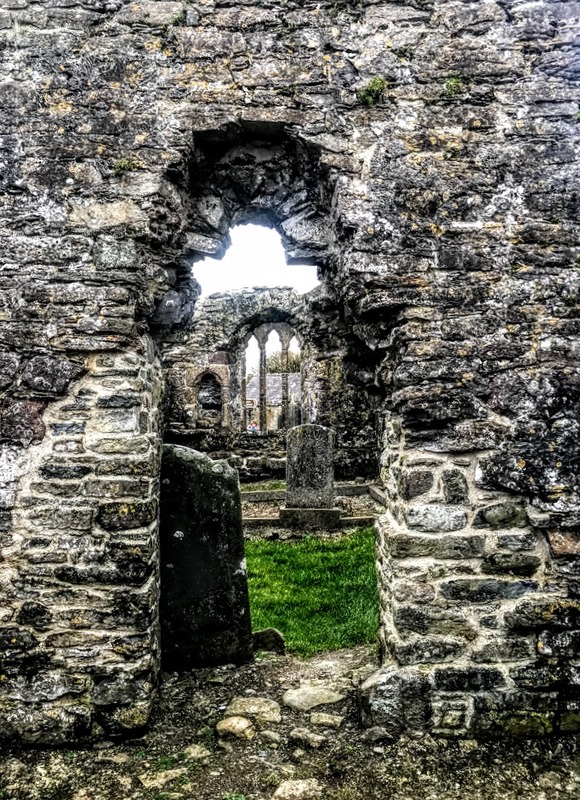 The original nave is earlier, and the east wall has remains of antae and a destroyed window over the chancel arch. The nave was extended at the west end and provided with opposing round-headed doorways towards the west end. 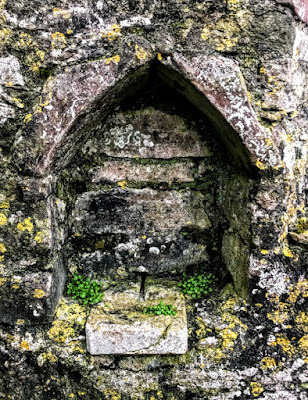 The doorway on the north side has a stoup in situ. There are corbels at the west end to support a gallery and the west gable has an unusual double bellcote. There is a blocked door towards the east end of the north nave wall. 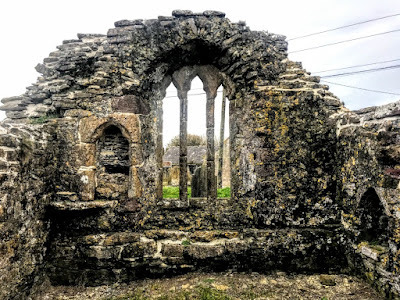 The chancel has a three-light ogee-headed window with glazing grooves on the wall and a statue shelf and niche at the north end of the east wall. There are three small windows on the south wall and one on the north wall. There is a piscina, aumbry and Easter Sepulchre in the chancel. 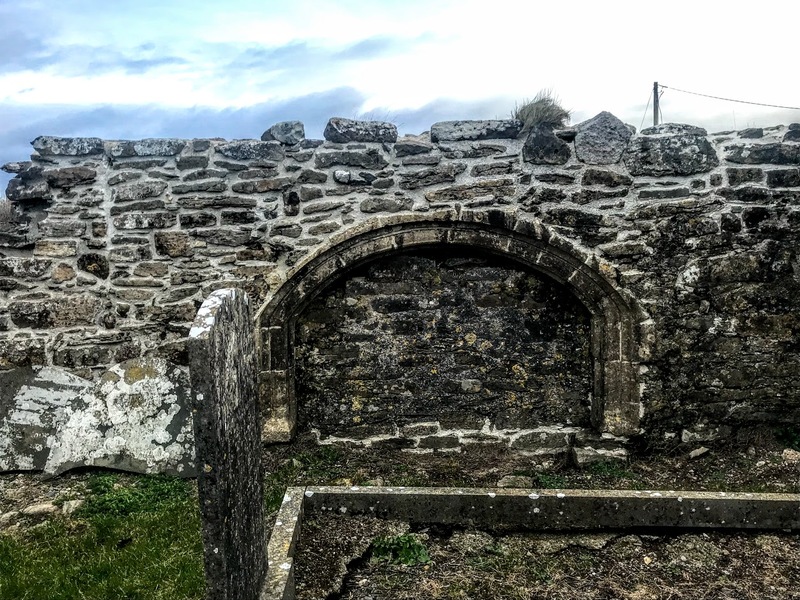 The names of local families buried in the surrounding churchyard include: Barry, Chapman, Colfer, Connelly or Connolly, Crowley, Dunne, Fanning, Fortune, Holland, Kavangh, Kennedy, Mason, Moran, Murphy, O’Brien, Power, Wallace and White. Saint Dubhán was commemorated on 11 February, and his story is still told as part of the guided tours of the Hook Lighthouse.